Who lives, who dies, and why We live in a troubled and wounded world in which humans continue to dominate and relentlessly kill numerous nonhuman animals. 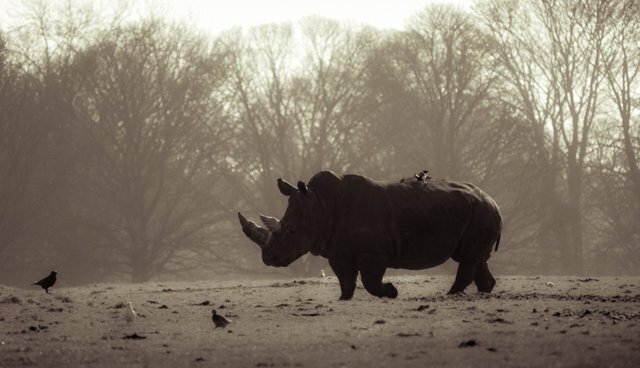 A Texas hunting club recently auctioned off an endangered black rhino purportedly to save other black rhinos and their homes in Namibia. A representative of the Dallas Safari Club noted, "Namibian wildlife officials will accompany the auction winner through Mangetti National Park where the hunt will occur, 'to ensure the correct type of animal is taken.'" This is not a very comforting thought. Nor is the idea that it's OK to kill one rhino to save other rhinos. Because of who we are we are always making decisions about who lives and who dies. The criterion used in these sorts of difficult decisions in the realm of conservation efforts centers on the debatable notion that we know what's best for the good of a particular species. As a result of this often misplaced thinking, individual animals are devalued and treated as if they're disposable objects and traded off for the good of their own (or other) species. In today's New York Times Richard Conniff published an essay called, "A Trophy Hunt That's Good for Rhinos"? He writes, "auctioning the right to kill a black rhino in Namibia is an entirely sound idea, good for conservation and good for rhinos in particular." This conclusion is too fast for me, and he does not present data that support this claim. Conniff claims that Namibia, a small and sparsely populated country, is a conservation success story. Over the past 20 years its rhino population has increased as have the number of mountain zebras, elephants and lions. This is because around 44 percent of the country benefits from conservation protection due to the establishment of communal conservancies that own the wildlife. Nowhere does Mr. Conniff argue that these success stories rest on killing some of these animals for the good of other members of their species. That's good, because we really don't know this. In Namibia and elsewhere black rhinos do indeed find themselves trying to avoid humans out to kill them, but in Namibia only 10 rhinos have been killed since 2006. Of course, this is 10 too many, but far fewer than have been killed in neighboring South Africa, where around 1,000 were killed in 2012 alone. For more on rhino slaughter in South Africa please see. Mr. Conniff also claims that the old post-reproductive and belligerent male who will be killed won't be much of a loss because individuals such as these "have a tendency to kill females and calves." Does having a tendency to do something warrant an individual's unnecessary death? No it doesn't. And, if these individuals were so harmful in any regular and significant way, one would think they would have been weeded out of the population over time due to natural selection or that they would be avoided and ostracized by other group members who fear them. This old male is merely a sacrificial rhino who's killed for a lot of money that will supposedly go into conservation efforts. We must revise some of the ways in which we attempt to coexist with other animals. Some of these methods center on heinous ways of killing them "in the name of conservation" or "to foster coexistence." Compassionate conservation stresses that the life of every individual matters and trading off an individual for the good of their own or another species is not an acceptable way to save species. And, there doesn't seem to be much evidence that it works in any significant way. The life of every individual matters. I agree with Conniff that "Protecting wildlife is a complicated, expensive and morally imperfect enterprise, often facing insuperable odds." Where I and others disagree is his swift claim that killing a rhino male is a sound conservation strategy. When people say they kill animals because they love them this makes me feel very uneasy. I'm glad they don't love me. Cruelty can't stand the spotlight and it is important that news about the sorts of activities discussed above be widely disseminated and openly discussed. That major media is covering them is a step in the right direction. Now it is essential that people who care about conserving without killing make their voices heard. Marc Bekoff's latest books are Jasper's Story: Saving Moon Bears (with Jill Robinson; see also), Ignoring Nature No More: The Case for Compassionate Conservation (see also), and Why Dogs Hump and Bees Get Depressed (see also).